More for the eyes. “The Angle Show”, an eclectic docuseries, is created/produced by Gemal Woods of Park Triangle Productions. Profiles: (Intersections) E. Ethelbert Miller interviews Sam Gilliam from Park Triangle Productions on Vimeo. 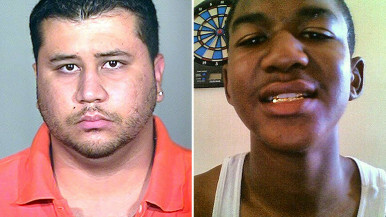 As “hoodie” photos flood the internet from known and unknown individuals around the country, it’s no surprise that the attorneys for George Zimmerman have done what defense attorneys do — “muddy the waters” of the story of their 28 year old Hispanic/White client who, on February 26, 2012, shot an unarmed 17 year old African American teen named Treyvon Martin in the “duty” of his “neighborhood watch” patrol in the already racially charged Sanford, Florida. The media is in that lockstep as well. 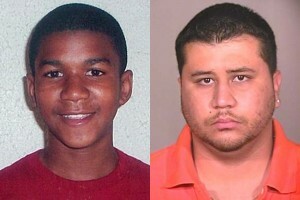 George Zimmerman is just one face in the crowd with a little Photoshop curving to punch up or down the color. Two weeks ago his single image was up for interpretation. Was he white? Was this a police photo? The only constant was that he shot Treyvon Martin. Only two people know the complete story. His word against a dead teen. Treyvon Martin has taken 3 faces leading into the classic single story line — the evolution of the menacing Black man. Florida’s “Stand Your Ground” law that protects persons from prosecution who think you may be a threat after shooting and/or killing you in self-defense is just words on paper. Nothing visually compelling to share on FB; too long to tweet. Does this look suspicious? I’m just sayin’. I want to give a SHOUT OUT to all the Electric Vehicle Associations across the country. Last month I attended a meeting for the EVA/DC. These were not just people showing off shiny new cars. They were showing us the future. Where was this group when I was looking for silicon cells for my solar energy science project? When I asked the question, someone held up a silicon cell chip. Just goes to show, it’s important to get “plugged in” to people in the know. EVA members are also on top of alternative energy and of course the electric vehicles. Some of them have converted their gas vehicles to electric. And yet skepticism still reigns as gas prices hit $4 + dollars a gallon. REVENGE OF THE ELECTRIC CAR, a new documentary by Chris Paine (who brought you “Who Killed the Electric Car”) will get you pumped up about electric cars again. ITVS Community Cinema is hosting free preview screenings around the country before the film’s broadcast on the PBS series “Independent Lens.” Here in the nation’s capital, we have two Community Cinema screenings — March 11 at Busboys and Poets; and March 18 at the Washington DCJCC. Both screenings will have electric cars displayed outside courtesy of EVA/DC. The Environmental Film Festival is also showing REC March 14 (tickets are for sale for that one). I’m re-posting the Community Cinema-DC post, “How Sweet is Revenge” about the recent news that GM was putting the pause on production of the Chevy Volt. Recently, the Detroit Free Press reported that GM suspended production of the Chevy Volt for 5 weeks. Apparently, Volts were selling well, better than the Nissan Leaf, but not well enough. Then a few days ago, the Volt made news again. It won the European Car of the Year. What a break! However, it’s still iffy on whether GM will revive the Volt with it’s $30,000+ price tag. Lots of questions and speculation continue to circulate about electric vehicles making the electric car an object of mystery and myth. You can see the Chevy Volt and judge for yourself this Sunday, March 11 at Busboys and Poets. A member of the Electric Vehicle Association of Greater Washington will display a 2011 Chevy Volt at 4 PM outside the venue as a preview for the 5 PM free Community Cinema screening of REVENGE OF THE ELECTRIC CAR. Busboys and Poets is located at 2021 14th Street, NW at the corner of V. A Nissan Leaf will be parked outside the Q Street entrance of the Washington DCJCC March 18 for the 3 PM Community Cinema Cafe screening of REVENGE OF THE ELECTRIC CAR. The Washington DCJCC is located at 1529 16th Street, NW at the corner of Q. The film will be followed by a Q&A with members and electric car owners of the EVA/DC. Be prepared for myth busters and tons of information about energy and the benefits of having an electric car. Read a review of REVENGE OF THE ELECTRIC CAR by Alexander Blosser (that also promotes the Busboys and Poets screening) in the Washington Examiner.